Save up to 10% for longer stays as well as 15% pay now discount. Enter your details in the booking engine to see which discounts apply. What do I need to rent a car with you? You need a credit card and a valid driving licensce. Can I rent without a credit card? If you only have a debit card, we accept debit cards that have the 16 digit number on the front if you also buy our Platinum Insurance package for the duration of your rental period. Please note: The cardholder/renter and the card used to pay for the booking has to be present at pick up and the card that is used to pay online has to be the same card as is used to guarantee the rental agreement. We offer our website visitors exclusive discounts on many 4x4 rental cars this month. When you book for 7-14 days you get an extra 5% off our website prices. When you book for more then 14 days that discount goes up to 10%. Iceland boasts three National Parks across its wild landscape. Iceland’s national parks are Vatnajökull, Þingvellir and Snæfellsjökull. 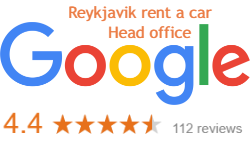 Reykjavik Rent a Car is a car rental Iceland service offering a wide range of both high-performance premium cars and environmentally-friendly cars. If you are looking for cheap car rental Iceland then we have a range of cars to suit your needs. Our main concern is simplicity in booking a car and giving clear and detailed information on our wide range of rental cars. Our website is very user friendly, with a simple online booking form which lets customers book in just a few easy steps. We have two main offices in Iceland including car rental at Iceland airport in Keflavik and car rental Reykjavik. This means you can pick up your car from the airport but also reach us at our Reykjavik office if you have a problem with your car hire. We only choose high-quality, reliable cars that fulfil even the strictest requirements. Our 4WD selection includes top makes such as Toyota Landcruiser, Toyota Rav4, Subaru Forester, Nissan Qashqai, Suzuki Grand Vitara, Suzuki S-Cross and the small and famous Suzuki Jimny. If you are looking for car hire Iceland then Reykjavik Rent a Car can help. We provide a wide range of options for car hire Reykjavik and at Keflavik airport so that you can find the perfect car rental to meet your needs.